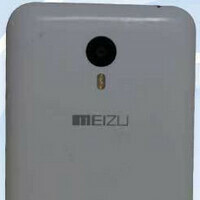 Meizu plans on releasing two handsets under the Blue Charm name. The Meizu Blue Charm is expected to carry a 4.6-inch screen, while the Meizu Blue Charm Note will reportedly feature a 5.5-inch glass. It is the latter device that has been certified in China by TENAA, the country's equivalent to the FCC in the U.S. The display on the Meizu Blue Charm Note is expected to have a resolution of 1080 x 1920 and a 64-bit octa-core MT6752 from MediaTek will be under the hood. 2GB of RAM should be on board, along with 16GB of native storage. A 13MP camera adorns the back of the phablet, while a 2MP snapper on front handles video chats and selfies. Powering the Blue Charm Note is a 3050mAh cell, which should offer good battery life to users of the device. Besides using the Blue Charm name on handsets, Meizu is planning on branding the moniker on a line of wearables, televisions, and perhaps even routers. We might learn more about Meizu's plans this coming Tuesday, when the company is expected to unveil the Blue Charm and Blue Charm Note. Too bad they never have microSD so they might ruin this one too. J.Wong: Keep calm and just buy buy buy an expensive one with big storage.